Hello and happy Monday to ya! It’s a sunny and clear day here in the Bay Area. After a week of torrential downpours things are looking brighter…at least for a day. Speaking of things looking brighter, how about some shiny glitter? 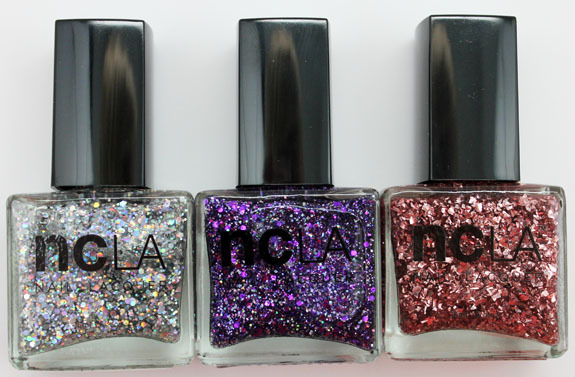 NCLA The Glitz is a three-piece nail lacquer set that comes with three ultra glittery shades. 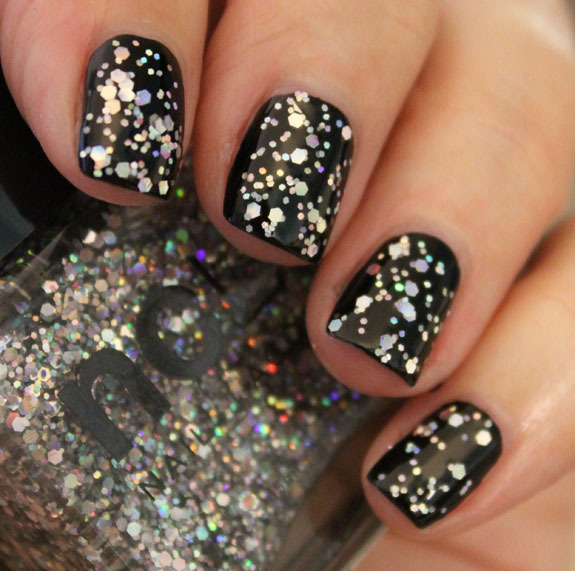 Hollywood Hills Hot Number contains different sized hexagonal silver and holo glitter pieces in a clear base. It’s quite holographic and sparkly. I got a good amount of glitter with just one coat, but did two here. Miss Sunset Strip features large hexagonal purple glitter and small sized purple, pink and silver holographic glitter in a clear base. This one was the least chunky and easiest to apply. Most of the glitter is smaller so it tends to stay where I wanted it and didn’t move around with a second coat. High Above The City Lights is an exclusive special edition in this set. It features large shards of rose gold colored glitter in a clear base. While I love the way this looks in the bottle and close up, I don’t love the way it came out on my nails. Some of the shards are fairly large and don’t want to lay flat, so that can be tricky. Plus it just looks messy to me. But oh how I love rose gold stuff! Pricing: $39 for the set. What do you think about these three shades? Note: NCLA is cruelty free. piCture pOlish New Shades for 2015! Miss Sunset Strip is calling me! I have something similar to the other two, but I might buy the set and give those as Christmas gifts. High Above the City Lights, it’s really pretty, too bad about application. When I first saw the color, I thought of it layered over Orly Rage… for maybe the most glittery rose gold nails ever. Looking closer at the photo, I can see what you mean about the way it lays. I love High Above The City Lights! My favourite of these three is Hollywood Hills Hot Number! YES, YES, YES! I love all of these! High Above The City Lights reminds me of glass shards, which is very similar to the China Glaze Lux and Lush from Hunger Games. They are hard to work with, but have a sweet 3D look when on. I think that Hollywood Hills Hot Number has hit the mark! Beautiful!! Those are all very pretty and festive. I recently have seen NCLA polishes for the first time in person at Ricky’s so I’m glad to see your review! Rose Gold is great, but I’m with you – if the glitter doesn’t lie flat, it really bugs me. High Above The City Lights is super pretty! I love glitter-esque polishes in that rose gold colour. I only like the second one. I feel the first one has already been seen, and the Rose gold leaf, looks a bit chunky in my opinion. I love the glitters! I like them all I just wish they were available in stores. While nothing is really calling out to me, they’re really festive. The one with the shards seemed so promising, but if they don’t lay flat on the nail, that’s a deal breaker for me. Miss Sunset Strip is pretty! Lulubelle´s last post…November Eco Emi: Great Month!